Oh no! It’s Halloween and Chip is coming down with a massive cold. He’s in a serious ‘munk funk and needs holiday cheering up, STAT! Scamper on over and be the buddy we know you are! We know that being Chip's best pal can be kind of hard at times, but he needs you. That Disney chipmunk is always trying to boss everyone around and it’s true, he struggles to know how to cut loose, but he was willing to try at tonight’s Halloween party. That’s why it’s so sweet that you’re bringing the party to him, and this Dale Pajama Costume will help the new shindig be a mellow but magnificent evening for Chip. You, after all, instinctively know how to get goofy and relax from time to time, making you the perfect pal for a control freak like Chip. You keep telling him that it is really not that hard; all he needs to do is opt for ultimate comfort and not plan too much. That’s the secret to good times. While we can’t help with the whole no planning thing, we think that this Dale Pajama Costume may help you channel your inner goofball even as you burrow in to keep your pal in high spirits. 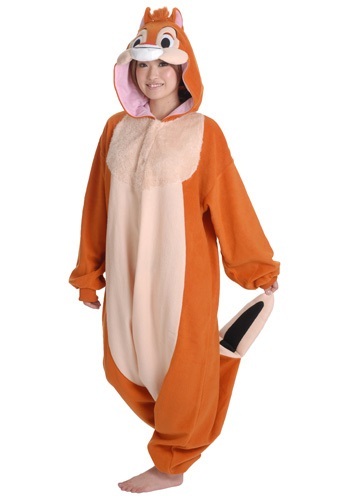 You two can watch movies and binge on acorns, then, when you get tired, this officially licensed velour onesie proves so comfy that you can just take a nap in it once Chip has enjoyed his soup, ice cream, and control of the TV remote. You’re a real swell little friend, Dale!